Kellogg Community College alumnus and U.S. Navy veteran Ron Leigh started classes at KCC on the advice of other veterans in 2013. By last fall, he was working to help veterans himself as a college student on the cusp of graduating with two associate degrees. Leigh, 60, is originally from Detroit but has lived in the Battle Creek area off and on since the early 1990s. A petty officer third class and communications yeoman with the U.S. Navy through the latter half of the 1970s, Leigh left the military in 1981. He spent the next several decades working construction and security jobs, eventually becoming a resident at Silver Star Apartments, a housing facility for homeless veterans located near the VA in Battle Creek. He lived at Silver Star for seven years, moving out in September to a rental elsewhere in Battle Creek, but he didn’t forget his fellow veterans there. Rather, when it came time to choose a capstone project for his Human Services Program at KCC last semester, Leigh chose to create a recreational therapy program based at Silver Star to help veterans interact and socialize in positive ways. The program saw veterans coming together several times per week for everything from music lessons and playing cards, chess and video games, to swimming and bowling at the VA and sharing free meals at Applebee’s on Veterans Day. Leigh says in addition to helping veterans come together, the program gave him a good way to phase out of his former living arrangements while helping him keep in touch with the other veterans there. Leigh started taking classes at KCC in 2013 through the Veterans Retraining Assistance Program (VRAP), a federal program that provides training assistance to unemployed veterans. He said he could’ve used the assistance at a school just about anywhere in the country, but chose KCC on the advice of other veterans he knew who were students and succeeding in their classes. Leigh earned an impressive a 3.828 GPA and become a member of the Phi Theta Kappa international honor society during his time at KCC, completing an Associate in Applied Science degree in Human Services and an Associate in General Studies degree in December, and he plans to walk in the KCC commencement ceremony this spring. Today Leigh is studying for a bachelor’s degree in Community Services at Siena Heights University, and in the future wants to work in the field of applied social psychology. In addition to the service work he’s done through school, he also volunteers with God’s Kitchen, a soup kitchen for veterans in Battle Creek, and is a Salvation Army soldier. “I have quite a bit of community service going on,” he says, laughing. As for his time at KCC, Leigh couldn’t be more enthusiastic when talking about his experience, particularly his instructors. When discussing which departments and instructors helped him succeed, the list of the motivators who supported him from orientation through graduation is a long one, encompassing several professors, advisors, staff members and departments ranging from Human Services to Service-Learning to Financial Aid to Career and Employment Services and a lot in between. For current students dealing with those same professors in their own studies, Leigh has some advice. Pictured above, Leigh stands in front of an American flag mosaic at Silver Star Apartments in Battle Creek. 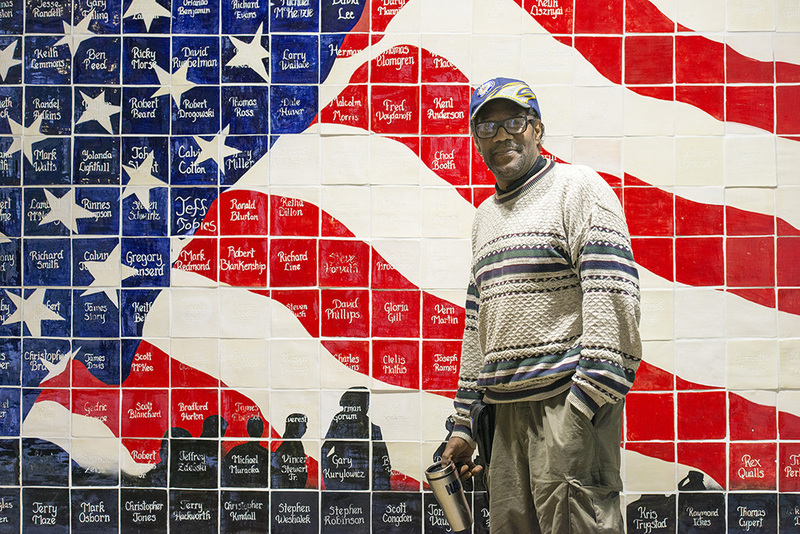 Each tile includes the name of a resident at the facility, which houses homeless veterans. For information about KCC’s veteran services or studying at KCC as a veteran of the U.S. military, visit www.kellogg.edu/veterans. Interested in studying human services? KCC offers an Associate in Applied Science degree in Human Services, as well as a Human Services Technician Certificate! For more information about studying human services at KCC, visit www.kellogg.edu/human-services.